iPhone is one of the top devices. 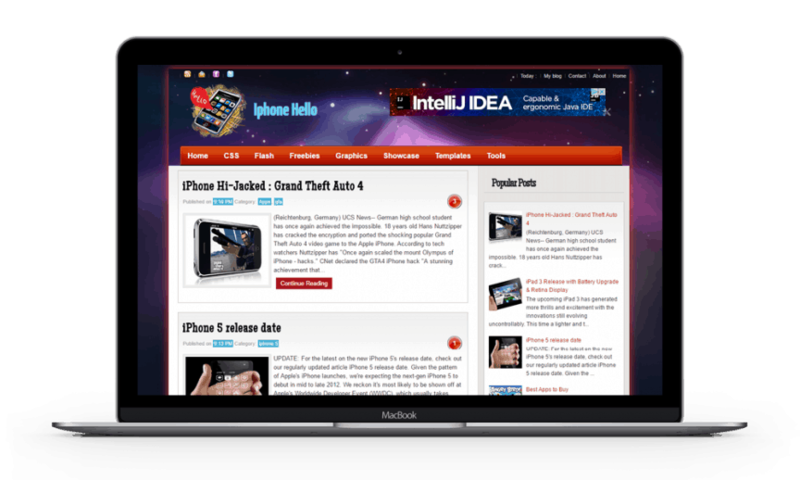 The iPhone Hello XML Blogger Template is recommended for those who are fond of sharing helpful information about iPhone. However, you can also use this XML Blogger Template for any product you want to share information about. What is the Navigation Layout of iPhone Hello template? Social Bookmark Icons are placed at the topmost part of the website. It gives your audience an option of which social media you have to follow. Moreover, they can move easily through the pages of your blog with the help of the Navigation Menu Bar. They can also easily look for articles to read as there is a popular post tab at the side. There are also excerpts of the posted articles on the homepage. Nonetheless, the navigation layout provides an ad space that you can utilize to campaign for products or affiliated markets. You can suitably use the iPhone Hello XML Blogger Template with product review blogs. Moreover, you can utilize it for tips, tricks, hacks and how-to methods for iPhones. Create informative and catchy articles to hook your target audience. Business blogs are not recommended to have this template because of its navigation layout. It only has one grid in its homepage for articles. It cannot showcase all of the products of a business. However, you can make a blog for your business with iPhone Hello and place campaign ads in your blog. There are a lot of people who are curious about the specs, functionality, tips, and tricks in using an iPhone. Hence, make use of the ad spaces that are strategically placed throughout the website. Make sure to place campaign ads of businesses that are related to your niche. It can spark the curiosity of your targeted audience. We all love sharing tips, tricks, and updates about the products that we love. The iPhone Hello template is best for your blog, especially if you are making an informative blog about iPhones. You can try the template by clicking the Demo button below. It is also free to download if you want to use the template for your blog. Tell us something about iPhone Hello template in the comment section. You can share this FREE XML blogger template with your friends and colleagues who love to share their knowledge and opinion about devices, especially iPhones. iPhone Hello	Overall rating:	5	out of 5 based on 1	reviews.